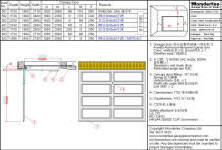 Counter weight balanced vertical bifold door. 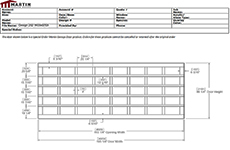 Proprietary Renlita door made in USA. Motorized by LiftMaster shaft operator. 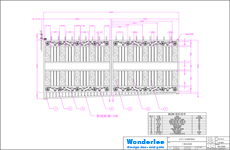 Weights 4 ton at 8.1m wide x 6.2m high. 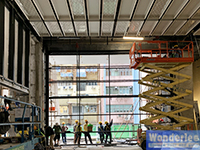 This is one of the largest automatic vertical bifold door in Hong Kong. 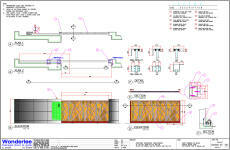 High speed curved slide gate for 8m wide driveway. 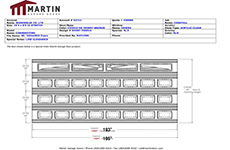 Proprietary design Ø30 stainless steel curved rail. 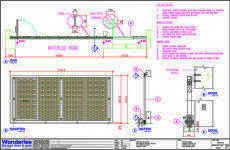 Tousek motor controlled by frequency convertor for high speed operation. Equipped with mechanical brake, absolute encoder and safety edges. 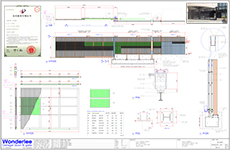 Design-and-build in record breaking 2-month lead time. 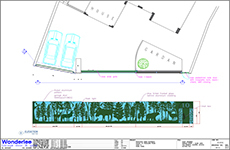 Trapezoidal shape, even gap at bottom to fit 6m wide driveway. Proprietary 1-way reduction gear to balance the gate in manual mode. 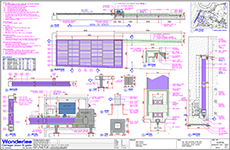 Driven by 3-phase Aprimatic motor for smooth operation. Equipped with mechanical travel limits and safety edge. 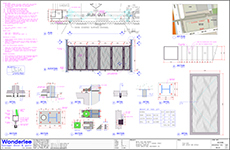 UHF radar for automatic access control. 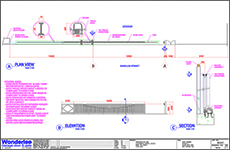 BD approval superstructure (Metal Gate). 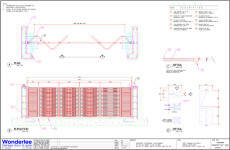 9m(w)x5m(h), powered by 2 Aprimatic hydraulic arms on each side. The larger leaf is over 2.5T in weight. 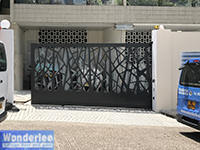 This is one of the largest automatic gates in Hong Kong. Built-in door-in-door for pedestrian access. 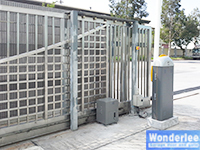 7m(w)x2.4m(h) slide gate powered by 3-phase motor at a high-security data center in TKO. 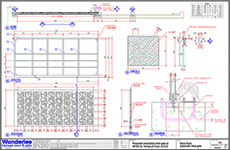 K4 rated designed and built by Avon UK, our partner in rated security barriers. 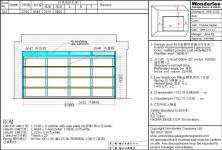 Ideal for embassy, bank, data center. GMS frame, powder coat finished. 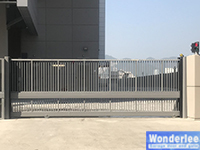 Uphill slide gate on 4° incline, no hang rail, 5m(w)x2.7m(h) opening. 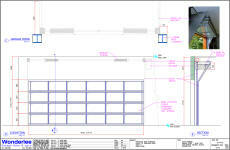 Powered by Aprimatic Onda 2001 opener for remote control access. 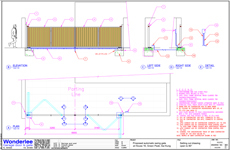 Ideal for inclined car park with adequate side room for normal slide gate. 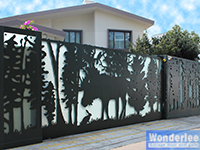 Aluminium cladded GMS frame, double-layer aluminium tree pattern. 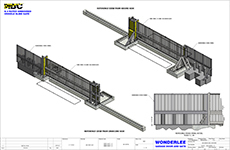 On-track curved slide gate, no hang rail, 5m(w)x3.2m(h) opening. 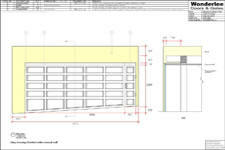 Ideal for car park with no side room for normal slide gate. 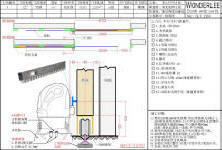 Aluminium cladded GMS frame, aluminium grille construction. 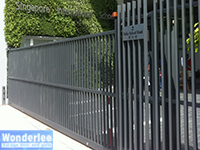 Patented telescopic gate, both leaves driven by a single motor. 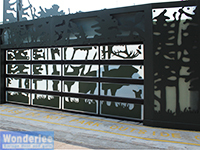 Ideal for car park entrance with limited side room. 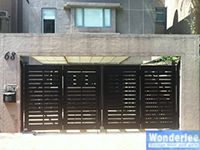 GMS frame, aluminium cladding, matching fence wall. 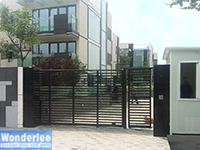 We designed and built 160 sets of gate for this prestigious development. 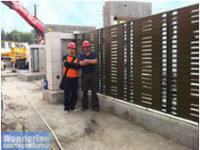 We were contracted by Sun Hong Kai to build a mock-up slide gate for one of her development. 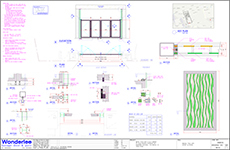 As-built shop-drawings were submitted for later tendering process. 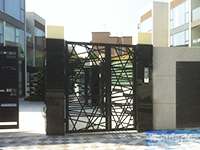 We were contracted by Sun Hong Kai to build a mock-up fold gate for one of her development. The resulting fold gate consists of 2.5 leaf on each side powered by LiftMaster SUB300 underground openers for remote-control access. 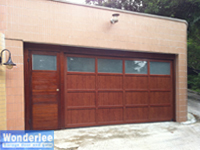 This is the first wood-looking aluminum 1-piece garage door installed in Hong Kong. We designed and built this with LiftMaster LM-1000 top of the line belt drive garage door opener. 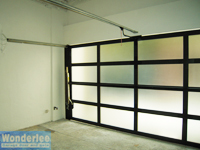 The frosted tempered glass panels on top of the door keep the garage well-illuminated by day. The pedestrian small door makes access very easy. 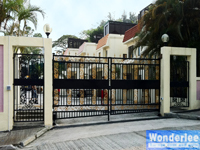 Owners at this gated community in Lantau wanted an automatic gate to keep the cows away. 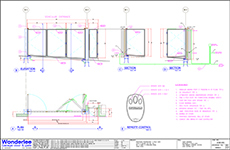 We designed a bi-part swing gate system with a LiftMaster SCS 300 openers. 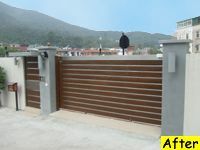 Owners and tenants use remote control to control the gate with auto-close enabled. 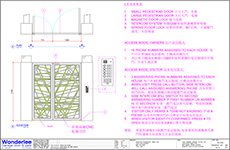 The system also includes magnetic lock and keypad access side door. Please click here to see detail. 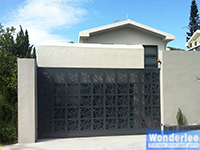 Architect contracted Wonderlee to design and build a garage door for a VIP customer. The covered carport situated on a 1:18 slope. 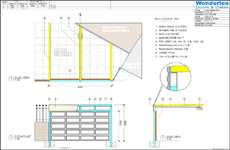 We designed a level garage floor with sectional overhead garage door with wood pattern flush panel. With LiftMaster garage door opener, the door operates smoothly and quietly by remote control. 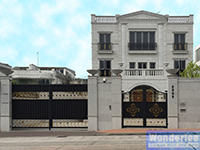 Wonderlee won the tender of this prestigious estate managed by Jones Lang LaSalle in Repulse Bay. 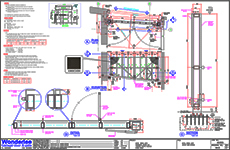 We designed a bi-part folding gate system with a LiftMaster SUB 300 openers. 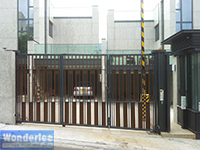 Owners and tenants use remote control or mobile phone to control the gate. 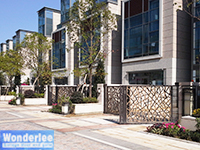 The folding gate operates smoothly and quietly. Please click here to see footage. 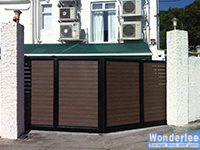 The owner in Tai Po would like a have the gate in natural wood with matching pedestrian gate. 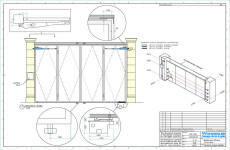 We designed a bi-part slide gate system with a LiftMaster SLY 500 openers. By using a 3-button remote control, he controls the gate in car mode or either side individually. We also wired up the garden light so that when the gate is activated at night with remote control, the garden light will be turned on too. 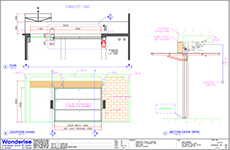 Doors for slope are always a challenge to architects and installers. 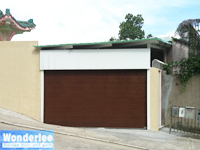 We designed and built this 1-piece garage door on a 1:15 slope in Clear Water Bay. 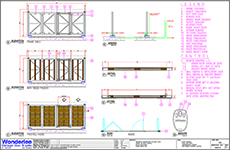 The door is Aluminum frame, with Aluminum and tempered glasses infill panels. Only 1-piece doors work well on a slope. 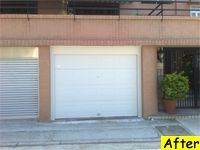 Sectional garage doors and roller shutters sit on uneven ground would not work well. 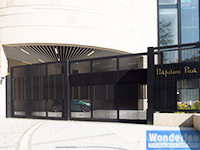 We also built a small pedestrian door with keypad access with Aluminum frame and glasses. 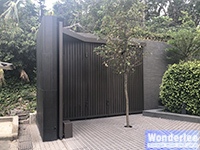 To match the overall architecture of the buildings, the owner chose a wood looking 1-piece door for the garage on a slope. 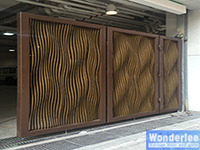 The door is built with wood pattern Aluminum frame and Aluminum infill panels. Only tilt doors work well on a slope. 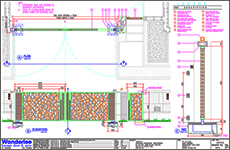 Sectional garage doors and roller shutters sit on uneven ground would not work well. 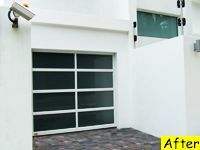 Tilt door opens 2 times faster than traditional garage door. 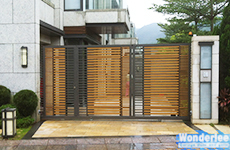 The owner in Kam Sheung Road would like a have the gate in natural wood. 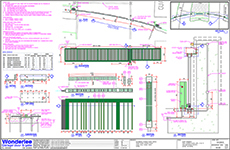 We designed a slide gate system with a LiftMaster SLY 300 openers. 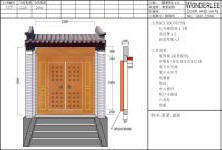 By using a 3-button remote control, he controls the gate in car mode and pedestrian mode. 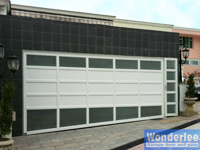 The owner in Hong Lok Yuen would like an unique garage door. 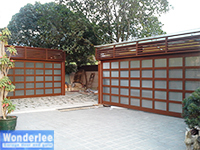 We designed and built this 1-piece garage door with tinted glasses. LiftMaster LM800A garage door opener installed for quiet and smooth operation. 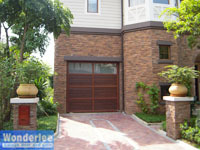 To match the stone architecture of the buildings, the developer chose a wood looking tilt door for the garages. 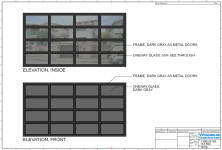 The 1-piece door is built with Aluminum frame, 1 row of frosted tempered glasses on top and 3 rows of wood infill below. LiftMaster belt-drive opener is installed for smooth and quiet operation. 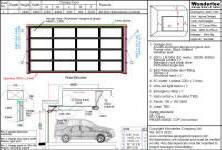 Tilt door opens 2 times faster than traditional garage door. Chick here to see more. 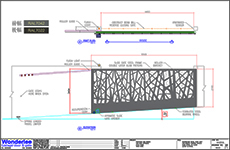 The owner in Palm Springs would like a have the gate in natural wood. 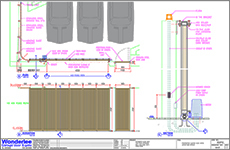 We designed a biparting slide gate system with 2 LiftMaster SLY 500 openers. 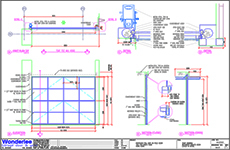 Tilt-proofing frame is built to ensure absolute safety. 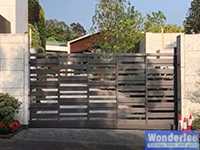 Click here to see the biparting slide gate in action. 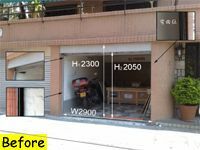 The owner in Tai Po would like a trendsetting garage suitable for seaside. 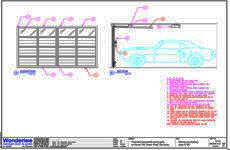 He selected sectional Aluminum garage door with frosted tempered glass, and LiftMaster electrical opener. 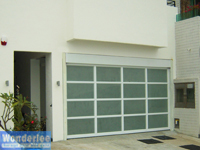 The white Aluminum frame and frosted glass is the perfect match to the architecture of the house. 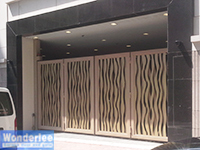 The Owners Incorporation voted for Aluminum doors when they re-renovated the building for its aesthetic appeal. 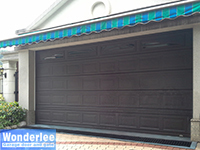 Canopy doors are ideal for garages with ceiling obstruction. 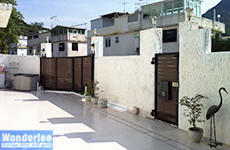 The new doors became a landmark of the neighborhood. 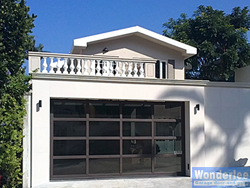 Click here to see the canopy garage door in action. 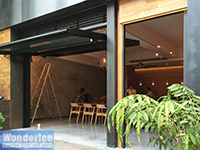 To match the architecture of the building, the owner chose matted black powder coated Aluminum frame with frosted tempered glasses. The garage is well lit at day, and becomes an amazingly beautiful scene at night when light turned on inside. 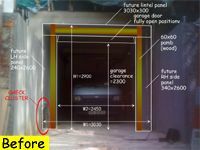 Click here to see 1-piece tilt door in action. 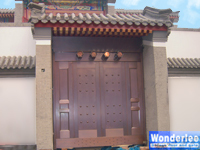 Traditional door for Siheyuan (四合院) built with copper. LiftMaster SCS 300 swing gate opener is installed for automatic access with remote control. Dial2open is also installed for telephone access. 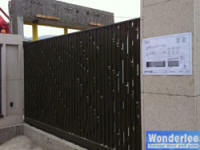 Because of wind load consideration, we designed this wooden swing gate with steel frame. 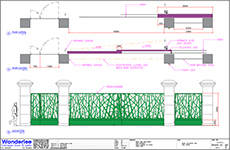 The gates are hinged into the ground as the 40cm x 40cm pillars would not be strong enough to support the heavy gates at 200 Kg per leaf. LiftMaster LYN 400 swing gate opener is installed. Each leaf can be controlled independently or jointly with a 3-button remote control. 2 LiftMaster SLY 300 slide gate opener is installed. 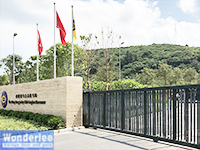 The 8 meter long galvanized steel slide gate weights 800Kg. For absolute safety and reliability, we installed a LiftMaster SLY 1000 opener. 3 pairs of infra red senor are installed to monitor closing operation; an additional pair of sensor is installed to monitor opening operation. 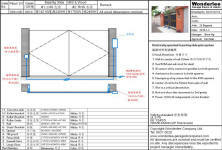 The gate is set to move at 20cm/second, in compliance to the Code of Practice of EMSD, HKSAR. 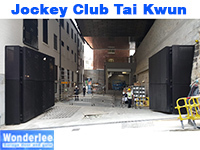 The new owner in Happy Valley inherited a roller shutter when he moved in. 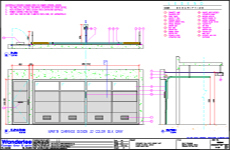 He ordered a galvanized steel sectional garage door with LiftMaster electrical opener. 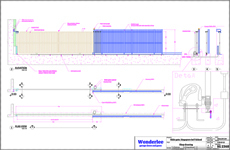 The sectional garage door is also a good 2" higher than the roller shutter next door. Click here to take an inside look. 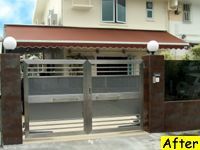 The owner in Stanley would like a trendsetting garage suitable for seaside environment. 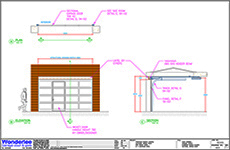 He selected Clopay Aluminum garage door with frosted tempered glass, and LiftMaster electrical opener. Aluminum and glass stand up perfectly against salty sea wind. 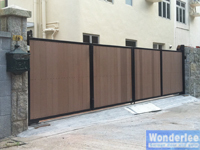 The owner in Sai Kung ordered a 5 meter stainless steel and wood slide gate to match the architecture of her house. 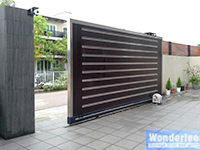 LiftMaster automatic slide gate opener was deployed to move this 500 Kg heavy gate. 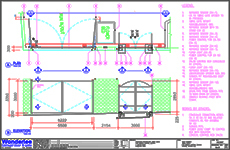 Rail and roller system was installed. 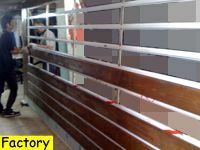 Because the weight of the gate, the rail sank almost 5mm. During this inertial period of 3 months, adjustments were needed. 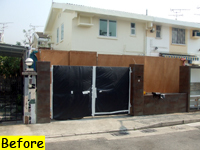 After the ground settled, the gate works smoothly. 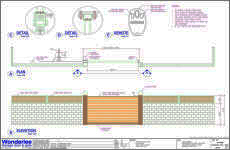 The owner would like an automatic gate when he moved into his newly acquired house in Fairview Park. 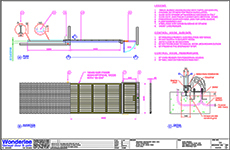 We recommended LiftMaster swing gate opener and stainless steel-glass gate design. 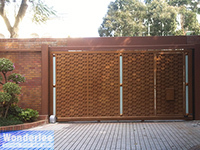 He opens the gate with remote control in his car when he comes home. An envy of his neigbours on rainy days.